Give Day donations will support student, faculty and facility needs. 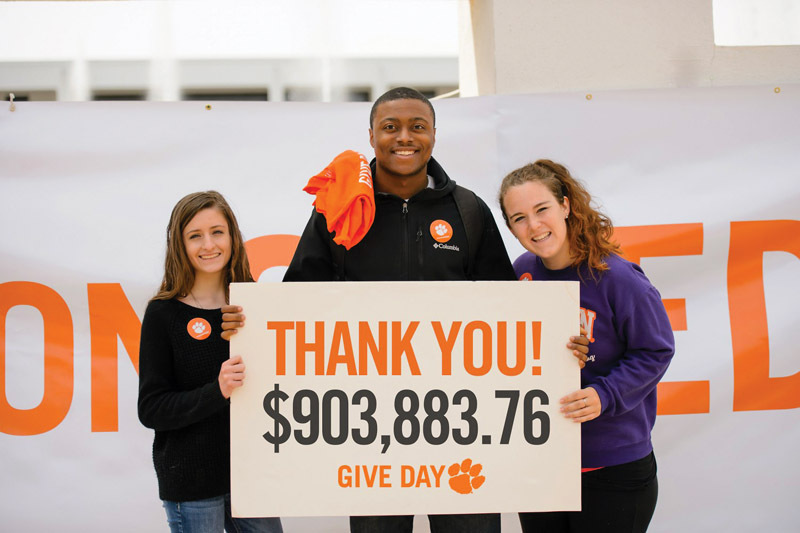 This spring, the Clemson family showed its generosity, with more than 3,000 donors giving more than $900,000 to support student, faculty, staff and facility needs during the inaugural Give Day event on April 6, also Clemson Founder’s Day. The gifts from alumni, students, faculty, staff and supporters — totaling $903,883.76 — helped the University exceed this year’s $105 million private fundraising goal, with a record-breaking $149 million in support of the Will to Lead capital campaign. Among Give Day donors was a couple who pledged $250,000 and Hubbell Lighting Inc., a corporate leader, with its $10,000 gift that will provide five $2,000 scholarships. More than half of the gifts were made online. There were 1,608 posts on social media — mostly Twitter — about Give Day. You can find more information about Give Day at clemson.edu/giveday/.